As mentioned in the previous post, our region is experiencing a near-Biblical plague of mice. "It's due to all the moisture we had this Spring, plus the flood displacing so much wildlife", someone mentioned. Unfortunately, where there's a plethora of mice, there's snakes, and not just the cool ones that mind their own business and snarf down a rodent now and then. Like the rat snake we adopted from friends, which was captured due to it being lazy and hanging around the chicken coop for easy eggs. That's a cool snake. First off, mouse management soapbox: I implore you, do NOT use sticky traps outdoors. It will trap ~anything~ that crosses its path, including small bunnies, squirrels and the aforementioned snakes, cool ones or otherwise. It's a horrible way to die. Instead, we had the local pest control company come out and install poison-bait boxes. They double-checked for us and confirmed that any poisoned mice (the product they use causes quick death via severe dehydration) are safe for consumption by both mammals and other avians, including chickens. Next, we're reconfiguring areas close to the house and animal shelters that are conducive to mouse habitat. We knew for sure there were mice living under one of the duck shelters. Demolishing the shelter moved to the top of the timeline lickety-split when I found a @#$!! rattlesnake in the nesting area. Thankfully, I was awake enough during that morning egg check to see the snake before I reached down. It was having a nice snooze. I didn't recognize it at first, so got a long stick to lift it up in order to check for rattles. Rattles there? Yep. It didn't start getting annoyed until I tried to move it out, so I closed off the area to keep the birds out, got on some boots & jeans, found the square-edge shovel, and went back out. The snake was now gone. Kinda glad I didn't have to kill it, but that also meant there was a rattlesnake on the loose, the first we've seen since we moved to this property. Eep. New duck feeding station, front view. Spouse made a new, bigger feed station to replace the old duck shelter /feed station (we still have one other shelter, which is plenty big enough for all). 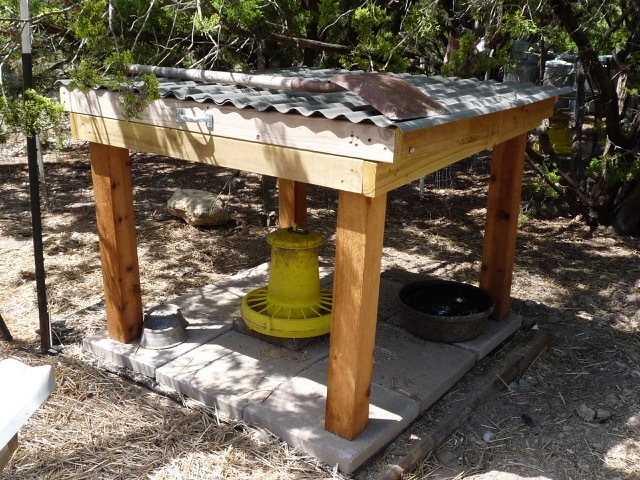 It's configured with the roof slanted and on a hinge, so the roof will shed water off the back, and the roof can also be lifted up if you don't want to bend down to grab the feeder. This weekend, he started moving the old duck shelter out of the pen and found... a couple of dead mice, and two very comfy & satisfied rattlesnakes living in the old mouse nest. No wonder the ducks were avoiding the shelter. Spouse decapitated the snakes as quickly/humanely as he could (see square shovel still on roof of new feed station), created a stable base, and installed the new feed station to replace the old one that had been part of the now-removed old duck shelter. 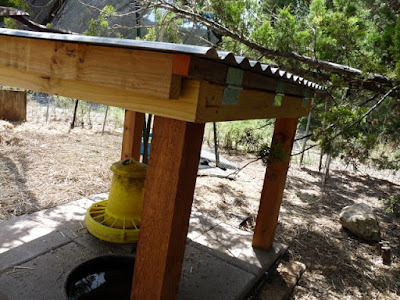 I may end up putting a rain gutter and spout on the back, connected to a large tub, as an additional source of water for the ducks to play in during the rainy season. New duck feeding station, back view. The dogs have been taken in for rattlesnake vaccines. You get the first vaccine, then a booster at three weeks, then a shot every six months. It doesn't prevent illness from bites, but instead gives the canine more time to be taken to the vet for treatment. The vet reported that one poor local dog was bitten four times, and the owner said it was the first time in 30 years they'd ever seen rattlers on their ranch. Seems like the Hill Country is a buffet for the snakes this year. When all's said and done, it doesn't bother me too much to have found rattlesnakes on the property. We've been fortunate to have avoided them for this long. It does mean taking a few more precautions before doing certain kinds of work, however, but that's manageable. As the area settles in for the Long Hot season, the mouse population will start dwindling, which should do the same for the snake population as well. Twisty chicken head - eep! Our smallest Ameraucana was no longer roosting. She could eat and drink, no problem. She gobbled down mealworm treats, and attacked pieces of fruit with gusto. She would, however, twist her head around to almost backwards whenever stressed in the slightest, and her equilibrium was off, making hopping up or down difficult. Off to the vet. Our regular guy was out of pocket, so we took her into the city, and were lucky enough to get a vet who not only knew avian medicine, but also had his own flock of hens. I decided to take the long-shot and work with the hen as if she had toxoplasmosis, and readied myself for days of force-fed antibiotics. So, toxoplasmosis: most know it as something that can infect cats, and can pass in their feces. Toxoplasmosis infection can also pass through a human and harm a fetus, so that's why you see all the warnings about not letting people clean cat litter boxes while pregnant or immune-compromised. Toxoplasmosis is also carried & passed by other mammals, including raccoons and mice. "Veronica" spent three long days in the recovery cage. She felt lonely, and let us know loudly and often. We'd move her from room to room to be with us, but far enough away that she wouldn't feel stressed by our movements. The fourth morning, she was showing some improvement, so I let her out into the general population. That evening, she was climbing up the roost ladder partway - still not getting up to the roost, but much better than before! I brought her in for evening meds, and put her in the recovery pen so I could easily nab her for morning meds the next day. She wasn't twisting her head so much this time, either. Gave her meds the next morning, let her out again. Last night, she was on the roost! She was having a bit of trouble due to two other hens trying to get her to move, but she was hanging on as best she could. Brought her in again for the evening meds, and back into the recovery pen until morning, when she'd get her next dose. She didn't twist her head around once during the carry into the house, nor when I took her out of the cage this morning. It's a sad thing about modern, mass chicken breeding: they're not bred for longevity and health, so veterinary medicine is still catching up on how to manage complicated or long-term hen health issues for home flock owners. As we saw recently in the U.S. with the poultry bird flu, oftentimes the easiest way to solve the problem is to kill the entire flock, sanitize the housing, and start anew. Sometimes, however, you win one, and that's Veronica this time. 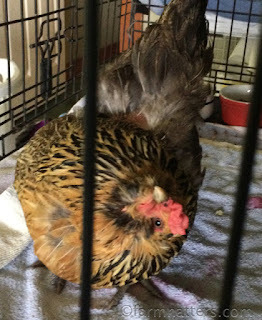 More on poultry and toxoplasmosis at this link. Since our birds have full run of our acreage, there's continued risk of toxoplasmosis, but less risk than if they were in an enclosed area. Think the mouse issue will be in the next post. It's been biblical around here.